A leading Shropshire solicitors firm has joined forces with two local design agencies to develop a new look. Wace Morgan Solicitors, which has three offices in Shrewsbury and one in Newtown, appointed Carl Jones Design and Morello for the project. “We wanted to strengthen and enhance our corporate branding and reflect this in a new website which will improve our customer service,” said Diana Packwood, managing partner of Wace Morgan. Church Stretton-based Carl Jones Design was recruited to refresh the Wace Morgan logo and give a complete new look to the firm’s Mid Wales office, Wace Morgan Tomleys in Newtown. Morello, which specialises in digital marketing and has its base in St John’s Hill, Shrewsbury, has given an overhaul to the Wace Morgan website, which will be re-launched shortly and has been designed by Carl Jones. Diana Packwood added: “It is good to have such talented design agencies in Shropshire – we are very pleased with the work both Carl Jones and Morello have carried out for us. 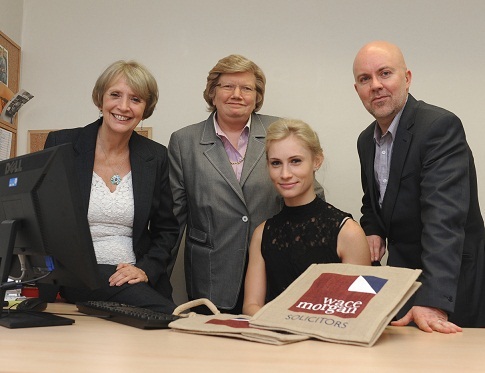 Diana Packwood and Debby Gittins of Wace morgan, with Sophie Pool of Morello and Carl Jones of Carl Jones Design.